In addition to these colleges, the state also offers two institutions of higher education that offer degrees or diplomas that take less than two years to complete. Programs in this category typically provide career training that leads to specific professional ambitions, typically in beauty, barbering, business, or technical skills. Because of the many educational options available, colleges in Idaho graduate a large number of students each year. 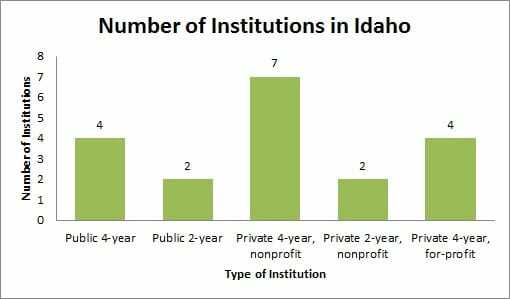 According to a 2014 report from the NCES, federal financial aid-eligible colleges and universities in Idaho granted 20,080 degrees and certificates to 19,009 graduating students during the 2011-12 school year. Among those students, 78 percent earned degrees at four-year colleges in Idaho. Further, another 21 percent earned two-year degrees. The remaining 1 percent, or 215 students, earned certificates or career diplomas from less-than-two-year institutions during the 2011-12 school year. Due to its large rural population, Idaho is the perfect place to earn a degree online. Further, steady growth in the availability of online courses has contributed to the popularity of online degrees. By pursuing an online degree program, students in Idaho can pursue their education from any place and at any time of their choosing. For many working adults, the ability to study remotely is the key to remaining in the workforce while continuing their education. Meanwhile, students who live far away from the state's biggest college campuses also benefit by earning degrees from the school of their choosing without packing up and moving closer to the big city. Although only one school in Idaho has been ranked by U.S. News & World Report for their online programming, a wide range of top notch institutions of higher education offer online degree programs in the state. Brigham Young University of Idaho, for example, offers 11 Bachelor's, six associate and nine certificate programs that can be completely entirely online. Further, both the college of Southern Idaho and the College of Western Idaho offer their share of fully online degree programs and hybrid education options. Two of the state's most prominent schools -- Idaho State University and the University of Idaho -- also offer online education options. The University of Idaho in particular boasts almost 20 fully online degree programs for students who want to pursue advanced education in fields such as engineering, education and science. According to the Bureau of Labor Statistics, Idaho's workforce was made up of 628,140 individuals in 2014. Combined, those workers earned a mean annual wage of $39,770 that year. While many occupations and industries in Idaho are ripe with opportunity, some are expected to hold more potential than others. As you ponder the idea of degree attainment in the state, consider the following list of top careers in Idaho based on employment projections and wage data. Due to a wide range of factors, becoming a diagnostic medical sonographer has become a hot proposition for many students. For starters, most workers in this field begin their careers with an associate degree in diagnostic nedical sonography and typically these programs only take two years to complete. As the BLS notes, most workers in this field earn an associate degree in diagnostic medical sonography or a bachelor's degree in sonography. Workers in related fields, such as radiation therapy, may also find work in this field after receiving some on-the-job training. Because physical therapy assistant programs only take two years to complete, this career provides quick entry into the workforce. Further, an overall demand for healthcare services adds to the popularity of this career. The U.S. Department of Labor predicts that employment for physical therapy assistants in Idaho could increase by as much as 40 percent from 2012 to 2022. According to the Bureau of Labor Statistics, physical therapy assistants typically begin their careers by completing a two-year physical therapy assistant program at an accredited school. These programs include both classroom instruction and hands-on learning, with a focus on English, algebra, anatomy, physiology and psychology. As languages other than English proliferate across the United States, the demand for interpreters and translators is expected to surge. Specifically, the U.S. Department of Labor predicts that job openings for interpreters and translators in Idaho will increase 38 percent from 2012 to 2022. The BLS notes most interpreters and translators begin their careers by earning a bachelor's degree in English or a foreign language. However, since the main requirement for this career is absolute fluency in at least two languages, students often get their start with degrees in other related fields. With construction and manufacturing on the rise in Idaho and elsewhere, it's no wonder that careers in this field are experiencing heavy demand. According to U.S. Department of Labor predictions, employment for cost estimators in Idaho could increase by as much as 36 percent during the decade leading up to 2022. Cost estimators typically need a bachelor's degree in an industry-related field to get started in the profession. A background in advanced math and construction is also helpful. In some cases, workers with many years of experience can also gain employment in this field without earning a degree. With so many businesses turning to technology for answers, it's no wonder that careers in computer science and computer-related fields are on the rise. Because of the overall demand for computer professionals, employment for information security analysts - the workers who keep computer networks and systems safe from outside intruders - is expected to surge. Specifically, the U.S. Department of Labor predicts that job openings for information security analysts in Idaho could increase by as much as 35 percent from 2012 to 2022. In order to find work as an information security analyst, candidates need to earn a Bachelor's degree in a computer-related field. Common degrees these workers earn include computer programming, computer science and information security. Candidates for advanced positions may need a Master's degree, however. As the BLS notes, many employers prefer to hire candidates with a Master of Business Administration (MBA) in information systems. While no particular degree can guarantee employment, this list of popular careers becomes easier to attain with a targeted education. Furthermore, many other careers in Idaho are expected to see exceptional demand. To learn more about hot careers, check out the latest career data at the U.S. Bureau of Labor Statistics. College tuition can vary widely depending on where you go to school, what you major in and whether you choose a private or public institution. The type of school you choose will also play a big role in your final costs. 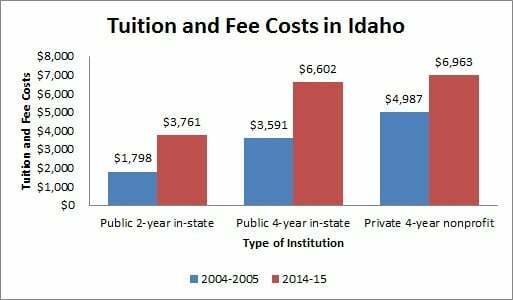 As a general rule, four-year colleges and universities in Idaho cost more, while two-year schools tend to cost less. Further, college tuition in Idaho has risen considerably over the past decade, as illustrated by a recent report published by the College Board. Using figures from the report, we compiled this list of average tuition figures and colleges in Idaho to show just how much costs have surged over the years. As you can see, the cost of higher education at colleges in Idaho has grown over the years. However, it's important to note that the cost of higher education in Idaho is considerably lower than the average cost in the United States. Further, many Idaho students may qualify for some type of student aid. In many cases, student aid can make the costs of college downright affordable. The first step towards determining whether you are eligible for student aid involves filling out a Free Application for Federal Student Aid (FAFSA) form. By filling this form out, you provide the information federal and state agencies need to determine what type of aid you may be eligible for. The Idaho State Board of Education also offers information on school-specific aid opportunities at local institutions such as Boise State University, Brigham Young University - Idaho, Idaho State University, North Idaho College and the University of Idaho. While some student aid comes in the form of scholarships and grants that do not need to be paid back, other aid may come in the form of special loans or loan programs. Loan forgiveness programs may also be available for students who pursue specific degrees and agree to work in a certain field for a predetermined length of time.